Your family s health is one of the most important priorities in your life. Fortunately, there are plenty of ways to keep everyone feeling their best, ranging from having pain relief medication on hand for those unexpected situations to using high-quality, tested products for hair or skin care. 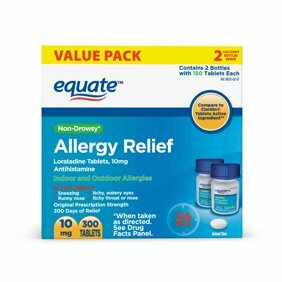 With Walmart s Equate brand, you can stock up on everything from vitamins and supplements to first aid and feminine care products to care for your family every day. Moreover, with our Every Day Low Prices, it's easy to fill your bathroom cabinet with the essentials, even when you're on a budget. Here's everything you need to stay comfortable and healthy at home. A headache is one of the quickest ways to ruin a day, but fortunately, the wide range of pain relievers we stock will provide relief fast so you can go about your day. Ibuprofen and paracetamol are the basic pain-relief medications you should have in your medicine cabinet. Both of these medicines relieve pain and reduce fever, so they're good options for viruses, headaches, and everyday pains and muscle strains. Migraine relief products generally contain a combination of aspirin, acetaminophen and caffeine that, when combined together, are very effective against headaches. Topical pain relievers are useful when you have muscle or joint pain because they can bring you quicker relief than oral medication, which takes about an hour to fully get into your system. During allergy season, noses are runny and eyes are itchy, so you need something to counteract these symptoms that's safe for children and adults alike. Some of the most common allergies that you need antihistamine medication for include hay fever, dust allergies, pet allergies and skin allergies. 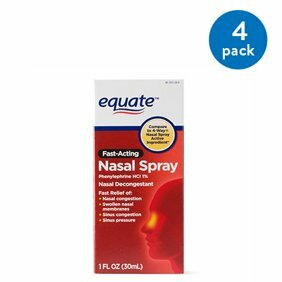 Equate nasal sprays are a good choice for treating a blocked nose from a cold, and they work well for hay fever and upper-respiratory allergies. For severe sinus headaches caused by allergies, use antihistamine caplets that also work wonders on itchy eyes and sinus congestion. Special allergy relief medication that's alcohol- and sugar-free is available for children. Sometimes, kids allergy medication has tasty flavors that make kids a little more receptive to taking medication when it's time for a new dose. From baby shampoos that are gentle on your little one s scalp and easy on the eyes to hair-regrowth treatments, Equate hair products are available for all family members. You can also keep your skin looking and feeling its best when you treat it with Equate skin products and sunscreen lotions. Hair products: Eliminate dandruff with a shampoo especially created for this purpose, or get rid of lice when your little one brings them home from school with a lice treatment kit or shampoo. Moisturizing and color-protecting shampoos and conditioners do wonders for your locks, while men can opt for a wide selection of styling wax and creams from the Equate Men collection. Skin products: Treat your skin well with our large selection of day and night moisturizers, masks and scrubs that are available for any skin type. Banishing blemishes and removing makeup is easy with our cleansing towelettes and liquid or foam cleansers that keep your skin flawless and glowing. Sunscreen: Whether you re heading for the beach or to the tennis court, don t forget to apply sunscreen to protect your skin from harmful UV rays. After-sun products are also available to calm your skin after sun exposure. With Equate sunscreen lotions, you get the best protection for the entire family in a range of SPF levels. Look for waterproof sunscreen if you're heading to the pool. Keep the entire family in tip-top shape with our selection of vitamins and supplements for adults and children. From kids multivitamin supplement gummies to calcium dietary supplements for adults, you can easily find everything you need in one place. Boost your fiber intake with natural fiber capsules, and ensure that you have a balanced intake of vitamins and minerals when pregnant with Equate prenatal vitamins. Build your family first aid kit with Equate supplies to be sure you have everything handy should an emergency happen. Treating small wounds and grazes at home is easy when you have basic supplies such as adhesive bandages, antibiotic ointments, gauze pads, alcohol swabs and antiseptic wash. Get prepared for emergencies that happen outside the house with a portable first aid kit for the car.